Nicotiana glauca is a much branched shrub or small tree often reaching 25 feet in nature. The leaves are thickish and rubbery to 10 inches long. It is native to s Bolivia and n Argentina. Blooming Time: Will bloom year around in warm climates. The yellow flowers are 1 ¾ inches long by ½ inches wide. Culture: Nicotiana glauca need full sun to partial shade with a deep rich soil. The compost we use consists of 2 parts loam to 2 parts peat moss to 1 part sand. For optimum growth keep the plant on the moist side. Fertilize monthly with a balanced fertilizer. The plant is a rapid grower so trimming will be needed to keep it inbounds. Trimming promotes more branches and more flowers. You should keep fading flowers trimmed off to keep the plant from producing seed. The plant can become quite weedy in the greenhouse setting. ALL PLANT PARTS ARE EXTREMELY POISONOUS! Propagation: Nicotiana glauca are propagated by cuttings or by seed. 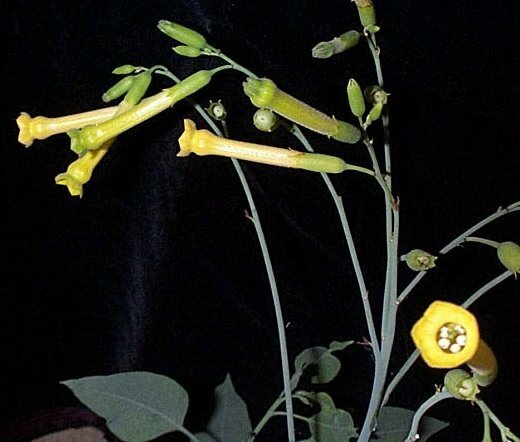 Nicotiana glauca was featured as Plant of the Week June 30-July 6, 2000.